We are part of the screening team at Galapagos NV. The focus of the company is to identify new molecules with attractive new mode of action against unmet needs diseases. The aim of the team is to support these projects by optimizing and performing biochemical and cellular based assays for SAR support and HTS campaign. We have recently invest on a Certus Flex to support our activities. It has been integrated into a HighRes Bio automated platform. The Certus Flex enables highly flexible dispensing capacities with good accuracy and low dead volume. It is a relatively reliable instrument. It is used for dispensing expensive reagents like antibodies for HCA assays or enzymes for biochemical assays in 384-well format. 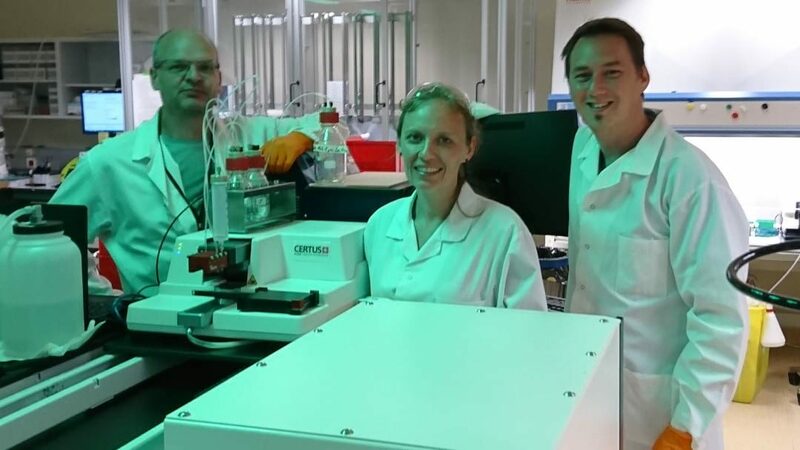 Thanks to its low volume dispensing capabilities, we will be eager soon to perform assays in 1536-well format. The software is really easy to use and the automation integration is smooth. It is already several months that we are working with the Certus Flex and we are satisfied with the instrument but also with the sale department and the service support of Fritz Gyger AG.